In the last three decades of the twentieth century, LGBT Latinas/os faced several forms of discrimination. The greater Latino community did not often accept sexual minorities, and the mainstream LGBT movement expected everyone, regardless of their ethnic and racial background, to adhere to a specific set of priorities so as to accommodate a "unified" agenda. To disrupt the cycle of sexism, racism, and homophobia that they experienced, LGBT Latinas/os organized themselves on local, state, and national levels, forming communities in which they could fight for equal rights while simultaneously staying true to both their ethnic and sexual identities. Yet histories of LGBT activism in the 1970s, 1980s, and 1990s often reduce the role that Latinas/os played, resulting in misinformation, or ignore their work entirely, erasing them from history. 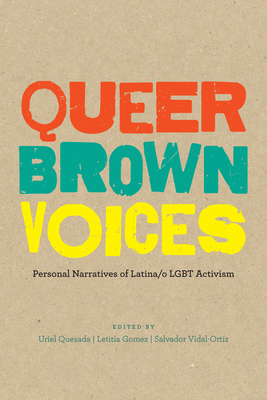 Queer Brown Voices is the first book published to counter this trend, documenting the efforts of some of these LGBT Latina/o activists. Comprising essays and oral history interviews that present the experiences of fourteen activists across the United States and in Puerto Rico, the book offers a new perspective on the history of LGBT mobilization and activism. The activists discuss subjects that shed light not only on the organizations they helped to create and operate, but also on their broad-ranging experiences of being racialized and discriminated against, fighting for access to health care during the HIV/AIDS epidemic, and struggling for awareness.